Discussion in 'Amps and Cabs' started by Rotten, Dec 8, 2016. Can anyone describe the differences between the two speakers? I'm going to be running a Twin Reverb into a single 15" and like to stay clean with a little bit of hair if I dig in. Thanks!! I think one of the differences is wattage. The D130 is only about a 25-30 watt speaker. I believe the K is much higher. I've never heard them described as sounding the same. I have a D series in a cabinet with an Altec 417C, sounds really nice. don't see how you can go wrong with K130 series. Jerry Garcia loved the K120s IIRC and he had some hair/compression when he dug into things. But you'll get probably more hair/breakup when you push the D130 just because of it lower rating. A K130 efficiency rating is 103 db, pushing it with a Twin Rev it will be one loud mofo. The K's seem to hold onto the "pretty/bell" thing a little longer than the D's which seem to pick up a little rasp at a lower volume. I've got a bunch of JBL 15's, lean toward the K's for cleaner sounds. My fave is a K, but oddly it's not the loudest of the 15's I use. I also do the Twin/1x15 thing, and normally do it as an impedance mismatch; 8 ohm speaker on the stock 4 ohm OT. I think that helps with the "little bit of hair when I dig in" effect. Cleaner speaker, amp down on power a little. I don't know what Twin you've got there, but for the most part those amps are at least a little out-of-control in the bass and you definitely don't need to exaggerate that with a sealed enclosure for the 15, so go with as open back a cab as you can. JBL 15's sound great in a stock Twin Reverb sized box, think Vibrasonic, same dimensions, so if you're thinking of replacing the 2x12 baffle with a 1x15 and keeping the combo format that's probably a good idea. Offsetting the baffle is a good idea too, again check the Vibrasonic cab dimension specs, not just for balance, I think the slightly assymetrical thing sounds better. Finally, if you do go for a new baffle you should consider radiussing the opening, flaring it out like a horn, "bullnose", right? Leave about an inch square around the T-nuts for mounting stability but flare the rest of it away. Makes a huge diff, really nice! slider313, amphog, tmac and 1 other person like this. Thanks for the comments. My Twin came in today. 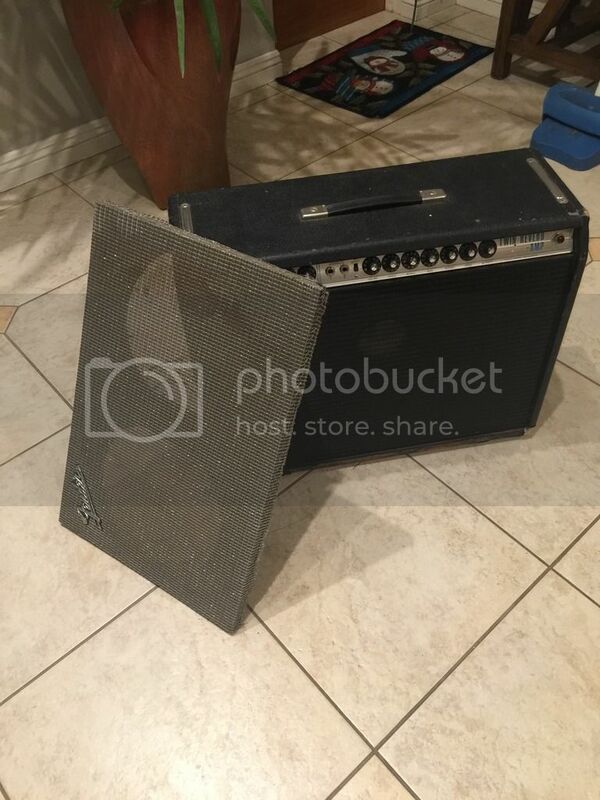 I traded another amp for it and all I knew was that it was a '72, non-master volume, with a replaced baffle and a 15" JBL. I was a bit surprised because I thought it was going to come with either a D130 or K130. It actually has a 16 ohm D15s, which is a model that I've never heard of. 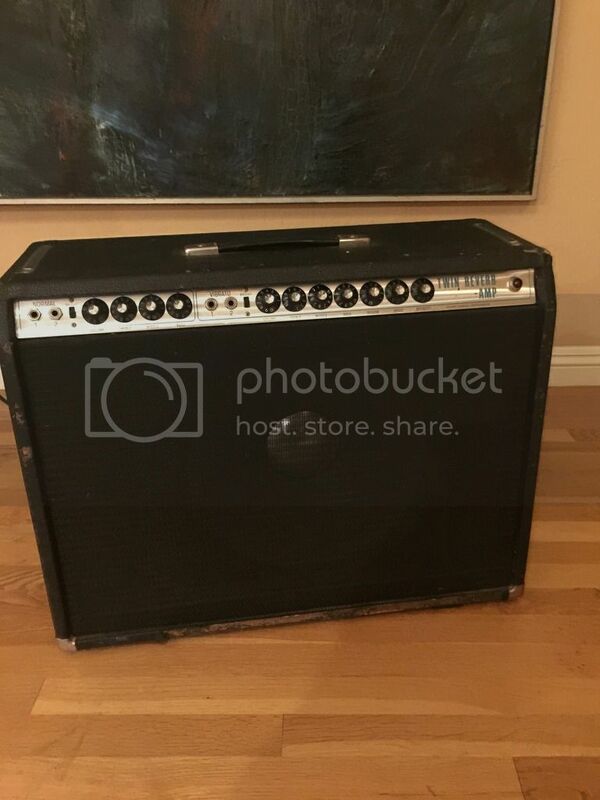 Still, the amp is in good condition and, other than the baffle and speaker, looks to be all original. Think I'll need start shopping for a speaker. Sounds like an 8 ohm K130 would be ideal. Is the current 16 ohm JBL too much of an impedance mismatch until I find something else? I don't want to destroy anything, but it looks like it's been in there for quite some time. Hey, I'm the mismatch guy and I think it's excessive. Not like the amp won't run, it's just too much to sound good. Assuming that Twin has the original stock 4 ohm OT. Probably does. And assuming that really is a 16 ohm JBL. You should check, might be a recone, might be mislabeled. Quick impedance fix under the circumstances would be pull two power tubes. Middle pair of 6L6's, remove them, the amp will be 8 ohms, probably louder and clearer closer to proper impedance without the gross mismatch even with half the output tubes missing. Measure it with a multi meter to be sure. I've read numerous threads stating that for some reason, JBL produced a lot of those marked 16 ohm but are actually 8 ohm. Haven't checked any recently but I recall seeing 12 ish on my 16 ohm JBL's. Anyway, yeah it'll read low. Wyzard and amphog like this. 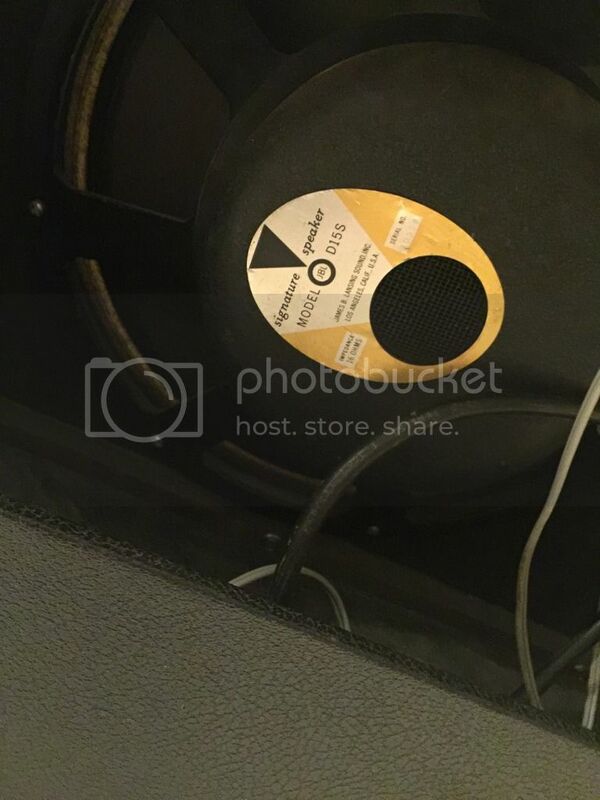 It's rumored (and argued about) that sometimes JBL just stuck a sticker on a speaker to make the buyer happy, but that they might or might not be actually 8 or 16 ohms. Definitely check it to be sure! I have an original 8 ohm D130 and it reads about 6.5 ohm. I use the 4 ohm tap on my Allen Oldflame and it sounds and works great. 5 -6.5 is pretty common for the DC resistance of a 8 ohm speaker, 11-13 for 16's. Are the speaker outs on a Twin independent? Are they two 4 ohm outputs or would it conceptually create a 8/4 mismatch if the main speaker out went to a 16 ohm speaker and the extension out went to another 16 ohm speaker? By the same token, would it create a match or mismatch by having the main and extension outs going to 8 ohm speakers each? Any of you 130 guys try the Quilter/Eminence 15" from the Steelaire? It was made to sound like a 130 and they sell them separately in their accessories dept. they are parallel jacks. 8 ohm speaker into the main speaker jack and 8 ohm speaker for the ext speaker jack will provide the correct 4 ohm load to the amp. So, you could disconnect one speaker in the twin for an 8 ohm load to the main jack and hook up an 8 ohm cab of your choice into the ext. speaker jack and provide the correct load to the amp. The amp wants to see 4 ohms.